Habitat : Cultivated throughout drier parts of india. Uses : Ashwagandha is tonic, abortifacient, astringent, deobstruent, nervine, and . It is official Indian Pharmacoepeia and is popularly known as Indian Ginseng. It gives vitality and vigour and helps in building greater endurance. 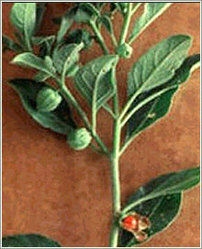 Ashwagandha has been used in diseases such as rheumatism, leprosy and arthritis. Used to treat general debility, arthritis, depression, chronic fatigue, insomnia, anxiety, depressed immunity, infertility and memory loss. It increases the iron content in the blood.